A RECENT ARTICLE on American site Your News Wire claims that Ireland has been deemed the ‘most corrupt nation in the western world’. That piece has since been shared more than 8,600 times on Facebook. But is there any concrete evidence to back up that statement? 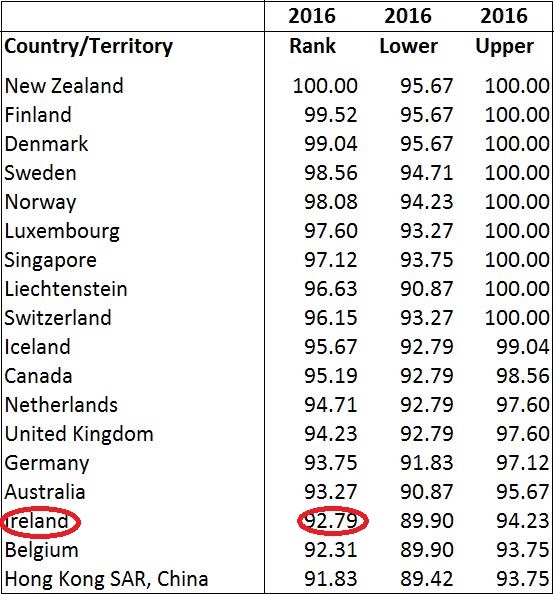 Ireland has been deemed one of the most corrupt countries in the western world. The claim appears on the American website YourNewsWire.com, written by Sean Adl-Tabatabai. However, that piece itself, which was published on 7 April 2018 relies exclusively for information on an opinion piece from the Irish Mirror. That piece, written by Mirror columnist and news reporter Pat Flanagan, was published over a year previously, on 31 March 2017. It dealt with a number of scandals involving An Garda Síochána that had come to light at the time, specifically: the fact that a million fake breath tests had been administered by gardaí (that figure eventually rose to closer to two million), the wrongful conviction of 14,700 people for driving offences who had already paid a fine, and a number of issues surrounding the financial accountability of the administration at the Garda training college in Templemore, Co Tipperary. The Garda (sic) were recently exposed laundering huge amounts of money and prosecuting 14,700 people who attempted to highlight their wrongdoing. As such, the inference regarding Ireland’s corruption levels stems from an opinion piece regarding alleged corruption within the Irish police force. No other allegations are made. Dan Hough is a professor of politics at the University of Sussex and director of the Sussex Centre for the Study of Corruption (SCSC). He states, in conversation with TheJournal.ie that the measurement of corruption is, in essence, impossible, given what is deemed corrupt, or what causes the most issues in the context of corruption, varies to a great extent from country to country. However, within the context of this FactCheck, it must be stressed that the original YourNewsWire piece essentially aggregates what is (one-year-old) opinion, and presents it as fact. Pat Flanagan’s writing opines, in the context of An Garda Síochána, that Ireland is the most corrupt nation in the western world. But that is only one opinion. “Wherever I go I ask people about the corruption in their country, and people always think they’re worse than they are. Ireland isn’t that bad. People always consider what’s closer to home as being the worst imaginable,” says Hough. Given the fact the American article states that Ireland has been ‘deemed’ to be one of the most corrupt nations, insufficient context is given – that is, the statement in question is based on one person’s opinion with no specific global statistics presented. It may be that Ireland’s police force is one of the most corrupt globally. Equally the opposite may be the case. No evidence is presented in either direction. The piece also fails to focus on any other elements of either the public or private sectors in Ireland, both of which are areas which, for good or ill, routinely face accusations of endemic corruption. If, however, one does choose to focus on corruption empirically (in as much as it’s possible to do so), it makes sense to take into account the data provided by worldwide corruption indices. There are many such, but in aiming for a global picture, the two most cited globally are the Corruption Perceptions Index of Transparency International (TI) and the World Governance Indicators (WGI) of the World Bank. Both cast Ireland in a reasonably favourable light in the context of corruption (in the context of the YourNewsWire article at any rate). TI’s model (which is probably the most cited in the world, and has been running since 1995) focuses on the public’s perception of corruption in the public sector, which would seem most appropriate given the YourNewsWire article focuses on Ireland’s police force. 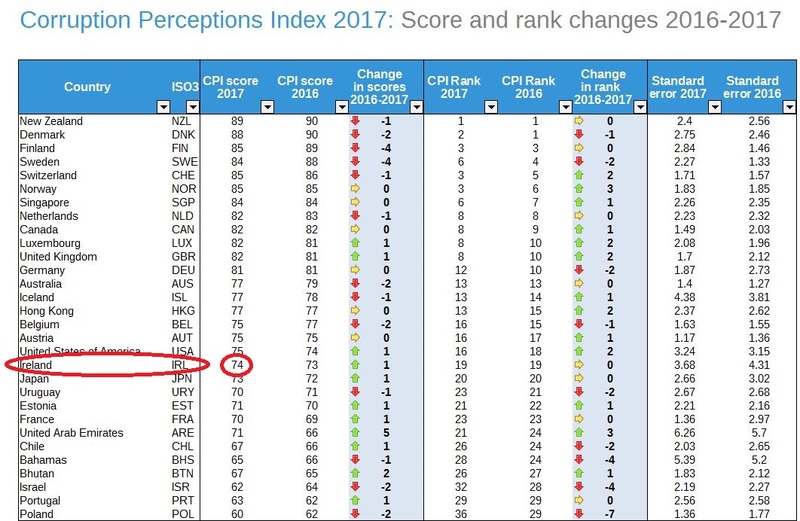 In 2017, the year the Irish Mirror piece was written, Ireland scored 74 out of 100 on the index (where 0 means highly corrupt and 100 equates to little or no corruption), ranking 13th out of 31 countries in western Europe, and 19th worldwide (out of 180 nations). Significant European countries that rank below Ireland include Spain, France, Portugal, and Italy. The US is one placing above Ireland in 18th, while Great Britain comes in 11th (the least corrupt nations list is dominated by Nordic countries, and New Zealand and Switzerland). Ireland’s rank was the exact same in 2016 – in fact, its score has gone up one from 73 to 74. The World Bank methodology meanwhile concentrates on a country’s (over 200 in 2016) control of corruption in terms of how a country is governed. Ranked again out of 100, the WGI data is a deal more dense than that of Transparency International (which essentially equates to a series of polls) as it focuses on annual surveys of households, firms, business information providers, Non Governmental Organisations (NGOs) and public sector organisations. In this context Ireland ranks 16th out of 201 countries on the corruption index, with a score of 93 in 2016. Significant western world countries placed below Ireland using this metric include Belgium, France, Japan, the US, Austria, and Italy (the least corrupt countries by this raionale are again Scandinavian nations like Finland, Denmark, Sweden, and Norway, while New Zealand again tops the tree). Without delving too deeply into the statistics, on both counts Ireland ranks significantly ahead of other western nations in terms of corruption. So while the Irish score is far from perfect, this country could not realistically be described as the most corrupt in the western world going on the available evidence. The initial opinion expressed by the Irish Mirror was that Ireland was the most corrupt nation in the western world. The headline of that piece stressed the fact that the opinion was that of Pat Flanagan however. One year later, YourNewsWire stated that Ireland has been ‘deemed’ to be the most corrupt country in the western world using the Mirror opinion piece as its sole basis. We feel that, given the context in which that piece appears, such a statement can not be made wholesale on those terms. And, while corruption is indeed impossible to definitively measure given everyone’s perception of what it is is different, by the most commonly accepted international standards Ireland doesn’t come even close to ranking as the most corrupt country in the developed world. Taking all this into account, we rate this claim as being FALSE. Email “FactCheck: Is Ireland really the most corrupt nation in the western world?”. Feedback on “FactCheck: Is Ireland really the most corrupt nation in the western world?”.